Both of my children started solids while we were vacationing in Italy, a summertime tradition in our family. Fresh fruits and veggies were readily available, either hand-picked from our garden or purchased at local farmer’s markets, so it was the perfect time to start them on their culinary journey. Once my children got used to traditional first foods, such as apples, bananas, carrots, and peas, I kept things exciting (and helped develop their palates) by incorporating fresh herbs and spices, as well as varying cooking methods. I swear that offering them such variety of foods, textures, and flavors helped them become the adventurous eaters they are today! Here are some of the first food preparations that my children loved as babies; consult your pediatrician about the best schedule to introduce new foods to your baby. Fruit makes a blissful match with yogurt, sure, but did you know that certain veggies are just as delightful? Pureed green beans and pear mixed with YoBaby yogurt is a crowd pleaser. Introduce your baby to a new texture by grating fresh apples. Add in other fruits she’s tried — plums and peaches are delicious with apples — once she’s ready for a little more adventure. Once your baby has tried both avocado and banana separately (to ensure she’s not allergic to either one), prepare a raw pudding made from combining the two. It’s as easy as mashing both with a fork and serving. For smoother consistency, blend with breast milk or formula. Banana puree is an early favorite. Introduce him to a new variation by roasting bananas in the oven to bring out their natural sweetness. Mash with a fork and serve. Add rosemary or thyme (for babies 8+ months) to roasted carrots, then puree or mash, for a flavorful dish your baby will love. This soft sweet fruit is delicious roasted in the oven, especially when garnished with some fresh mint. Puree for a delicious topping for (pureed) beef or lamb. Make baby-friendly overnight oats by combining pureed peaches with instant oats and breast milk or formula. Yum! Prepare a baby-friendly pea risotto by mixing mashed or pureed peas with steamed, pureed rice. Season with fresh basil. Bake plums in the oven, puree, and serve as a plum sauce for pureed chicken or turkey. Roast sweet potatoes with apples, then sprinkle lightly with cinnamon, for an irresistible fruit-veggie combo. 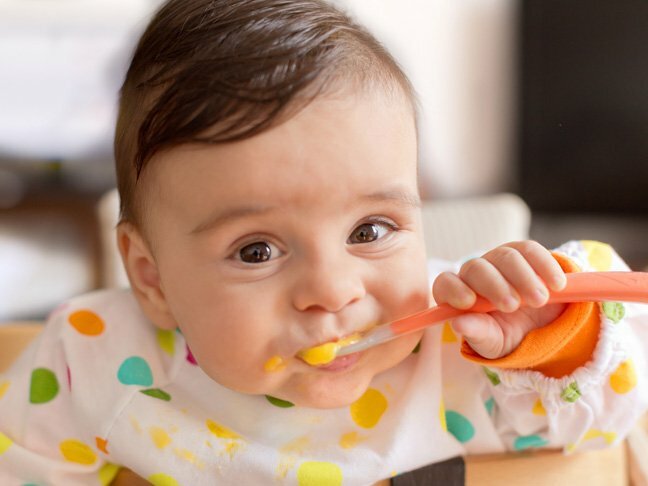 Whip up baby-friendly mashed potatoes by combining pureed green beans with steamed potatoes and breast milk or formula.